The Channel Tunnel and the high-speed railways now connecting to it in Britain, France and Belgium between them represent the most formidable civil engineering achievement 20th and early 21st centuries. The tunnel has provided a long-overdue connection between Continental Europe and its principal offshore island, and has already proved its value, if not always quite in the way its promoters intended. It is now established as an essential means of conveying lorry traffic between Britain and the Continent , and has proved relatively successful in generating rail passenger traffic and rather disappointing in encouraging rail freight, which it was assumed would become more competitive than the rail ferries that produced the tunnel. Promoters of a tunnel over the centuries had envisaged it having a geopolitical impact, but they could not have foreseen its role as a route to Britain for asylum-seekers and illegal immigrants as a great movement of populations began out of Eastern Europe, the Middle East and Asia at the close of the second millennium. The story has turned out to be extremely complex and diverse. 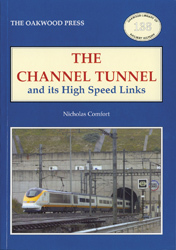 The concept of a Channel Tunnel, and its implications for Britain and its railways, is a fascinating one, and we are fortunate that at various stages in the author’s life he has been close to the project. At school he shared a desk with the son of Deryck Abel, one of the leading campaigners for a tunnel during the 1950s. As a Lobby correspondent with the Daily Telegraph the author monitored the political manoeuverings that led to the adoption of the Eurotunnel scheme, and the detailed Parliamentary examination of the Channel Tunnel Bill. As a co-author with Bronwen Jones of the book The Tunnel: The Channel Tunnel and Beyond he visited the tunnel construction sites just as work was beginning. Again wearing his journalist’s hat, he followed closely the construction of the tunnel, being on the first press trip through it in March 1991 and on another occasion sharing a helicopter with Sir Alastair Morton. He was on the first Eurostar to Paris in October 1994 as a guest of European Passenger Services, and has in his various guises – including a spell as a lobbyist for London & Continental Railways (LCR) – kept a close eye on the promotion of the Channel Tunnel Rail Link. As consultant on European presentation to the Department of Trade and Industry, he was to become a frequent – and satisfied – Eurostar traveller to Brussels. And as special adviser to the Secretary of State for Scotland, was closely involved in efforts to end the disruption of tunnel freight traffic by asylum-seekers, because of its disastrous effect on Scottish whisky exports! A5 format, 256 pages, more than 100 illustrations / maps / plans etc.